16 www.coalage.com June 2017 news continued shipped 8.8 million tons of PRB coal during the quarter at an aver- age price of $10.92/ton, while NAPP shipments totaled 2.2 million tons at an average price of $44.39/ton. Within the trading and lo- gistics segment, 1 million tons of coal were shipped at an average price of $158.62/ton. The company reported total costs and expenses during the first quarter of $476.8 million and cost of coal sales was $368.2 million. The cost of coal sales in CAPP during for the quarter av- eraged $74.79/ton. 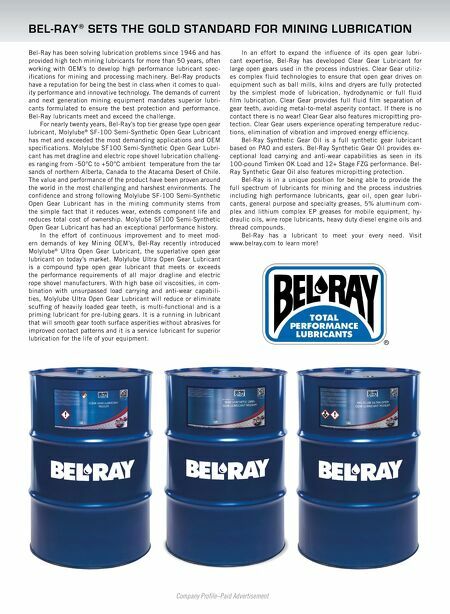 NAPP and PRB costs averaged $29.55/ton and $9.52/ton, respectively. Trading and Logistics average cost of coal sales was $134.04/ton. DOE Awards $6.9M for Research on Rare Earth Elements The U.S. Department of Energy's (DOE) Office of Fossil Ener- gy announced it is investing $6.9 million in rare earth element (REE) research through two funding opportunities. The agency announced that three projects have been selected to receive ap- proximately $3 million for research aimed at producing salable REEs from domestic coal and coal byproducts. In addition, the DOE has announced the availability of an additional $3.95 million for projects in three new topic areas to accelerate separation and extraction processes for REEs. REEs are a series of 17 chemical elements found in the Earth's crust. Due to their unique chemical properties, REEs are essential components of technologies spanning a range of applications, including electronics, computer and communication systems, transportation, health care, and national defense. The demand for REEs has grown significantly in recent years, stimulating an interest in economically feasible approaches for domestic REE recovery. Since 2014, DOE has engaged in research to determine the economic feasibility of producing REEs from domestic coal and coal byproducts. The new projects were selected under the Production of Sal- able Rare Earth Elements from Domestic U.S. Coal and Coal By- products funding opportunity announcement (FOA). Descrip- tions of the selected projects follow: • High Yield, Economical, Large Scale Production of Market- able Rare Earth Element Products from Coal Mining Re- fuse—Equinox Chemicals LLC, located in Albany, Georgia, and project partners will conduct laboratory testing and pre- pare a technical design for a pilot plant to produce salable REEs. They will use byproducts from an existing eastern Kentucky coal preparation plant as their source of REEs. Their phase 1 design will consider recovery and sale of coal from these preparation plant byproducts as an additional source of revenue; (DOE: $999,983); • Recovery of Rare Earth Elements from Coal Mining Waste Materials—Inventure Renewables, located in Tuscaloosa, Alabama, and project partners will use coal-related materi- als from an eastern Pennsylvania anthracite coal mine as their source of REEs. In phase 1, they will conduct labora- tory testing and prepare their technical design for a pilot plant to produce salable REEs; (DOE: $1 million); and • Production of Salable Rare Earth Elements from Domestic U.S. Coal and Coal Byproducts—Marshall Miller & Associ- ates, located in Bluefield, Virginia, and project partners will con- duct laboratory testing and prepare their technical design for a pilot plant to produce salable REEs. They will use byproducts from an existing West Virginia coal preparation (coal washing) plant as their raw material for extracting REEs. Their phase 1 design includes recovery and sale of dry, fine, high-quality coal from this raw material as an addition- al source of revenue, (DOE: $1 million). 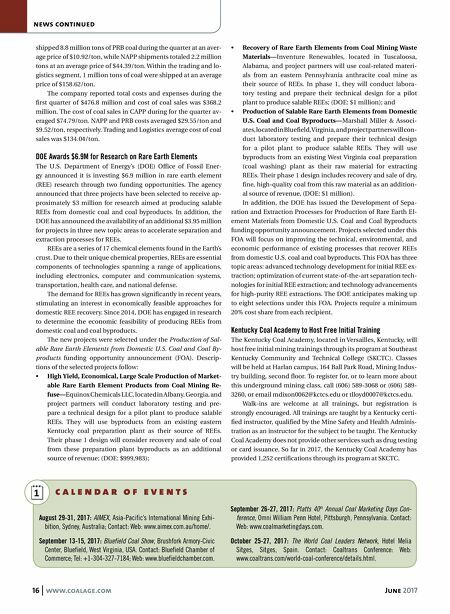 In addition, the DOE has issued the Development of Sepa- ration and Extraction Processes for Production of Rare Earth El- ement Materials from Domestic U.S. Coal and Coal Byproducts funding opportunity announcement. Projects selected under this FOA will focus on improving the technical, environmental, and economic performance of existing processes that recover REEs from domestic U.S. coal and coal byproducts. This FOA has three topic areas: advanced technology development for initial REE ex- traction; optimization of current state-of-the-art separation tech- nologies for initial REE extraction; and technology advancements for high-purity REE extractions. The DOE anticipates making up to eight selections under this FOA. Projects require a minimum 20% cost share from each recipient. Kentucky Coal Academy to Host Free Initial Training The Kentucky Coal Academy, located in Versailles, Kentucky, will host free initial mining trainings through its program at Southeast Kentucky Community and Technical College (SKCTC). Classes will be held at Harlan campus, 164 Ball Park Road, Mining Indus- try building, second floor. To register for, or to learn more about this underground mining class, call (606) 589-3068 or (606) 589- 3260, or email mdixon0062@kctcs.edu or tlloyd0007@kctcs.edu. Walk-ins are welcome at all trainings, but registration is strongly encouraged. All trainings are taught by a Kentucky certi- fied instructor, qualified by the Mine Safety and Health Adminis- tration as an instructor for the subject to be taught. The Kentucky Coal Academy does not provide other services such as drug testing or card issuance. So far in 2017, the Kentucky Coal Academy has provided 1,252 certifications through its program at SKCTC. c a l e n d a r o f e v e n t s August 29-31, 2017: AIMEX, Asia-Pacific's International Mining Exhi- bition, Sydney, Australia; Contact: Web: www.aimex.com.au/home/. September 13-15, 2017: Bluefield Coal Show, Brushfork Armory-Civic Center, Bluefield, West Virginia, USA. Contact: Bluefield Chamber of Commerce; Tel: +1-304-327-7184; Web: www.bluefieldchamber.com. September 26-27, 2017: Platts 40 th Annual Coal Marketing Days Con- ference, Omni William Penn Hotel, Pittsburgh, Pennsylvania. Contact: Web: www.coalmarketingdays.com. October 25-27, 2017: The World Coal Leaders Network, Hotel Melia Sitges, Sitges, Spain. Contact: Coaltrans Conference: Web: www.coaltrans.com/world-coal-conference/details.html.